Ahead of the weekend, tickets can be purchased from the Derby LIVE Sales & Information Centre, on the Market Place in Derby, by calling 01332 255800, or by visiting the Derby LIVE Website. From 4pm on Friday 4 October, and throughout the festival, the box office will be located in the foyer of the Guildhall Theatre. Your tickets will need to be exchanged for wristbands at this box office. Day and evening tickets, as well as weekend ones, will also need to be exchanged for wristbands in the same way. 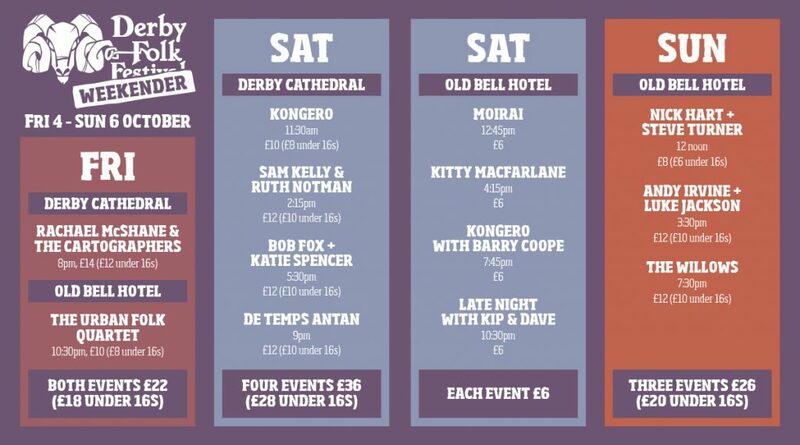 Remember that for 2019’s Derby Folk Weekender, these are individual concerts, and you’ll need a ticket for each… Multi-buy offers are in place for: Friday evening / Saturday Cathedral / Sunday Old Bell packages.